Description: Sexes similar. Small. 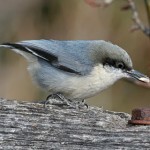 Blue-gray above, with gray-brown cap; indistinct black eye-line; faint white smudge at base of nape; and creamy white below. Habitat: Generally associated with ponderosa pine forests, especially those that are open and park-like. 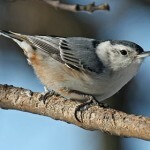 During winter, vagrants may appear in cottonwood forests along rivers, often in small flocks. Where in Nebraska: Regular, but local, permanent resident of the Pine Ridge area. Vagrants appear elsewhere in the state during winter, east to Lancaster County. 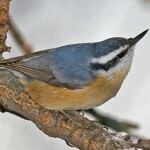 Field Notes: Pygmy Nuthatches nest in the cavity of a dead pine or stump approximately 15 feet from the ground. 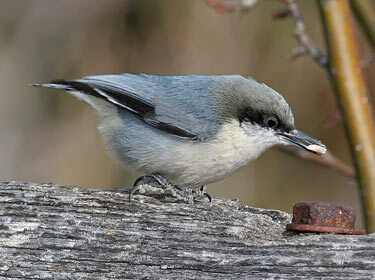 Fun Facts: Offspring from the previous year’s nest often help Pygmy Nuthatchs with the new year’s nestlings.